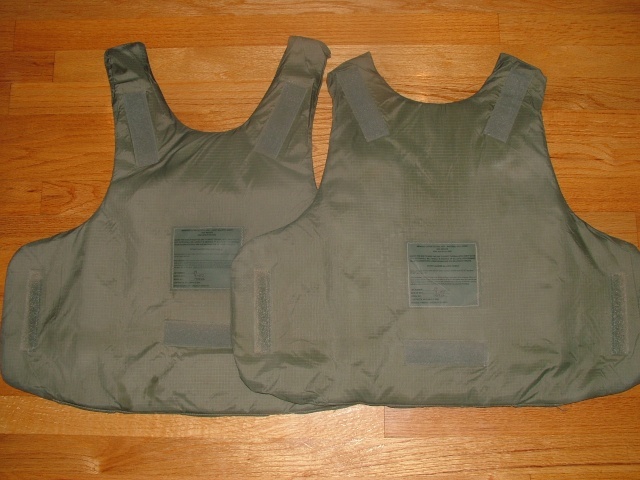 Here is my IOTV vest with soft inserts that I had gotten for REALLY great price. It even came with back and front SAPI plates but I placed them in my IBA/OTV vest. I saw this vest WITHOUT soft inserts for $300 at militaria/gun show once. I need ESAPI front, back, and side plates for it but it is probably impossible to obtain them right now. Nice condition vest. I personlly hate the IOTV though for tactical purposes. With some modifications I would take an IBA any day of the week. I can say this with certainty as I wore both vests for 12 or more hours every day for a year each. Thanks guys for kind comments. I had to put it together myself but the quick release cords are b***h to connect the vest together. It is loose right now but it displays fine. It would be nice if someone who is currently in service could scan how-to set it up from IOTV use and care manual. Speaking of IBA, I'm hoping that one day I'll be able to obtain ACU one, I would have to wait till IBA/OTV has been fully replaced by IOTV, at this point more vests would show up. Very Nice Item i like it ! Very hard found :thumbsup: . There is not manual we were given, just a two hour class during RFI. We tore them down, put them back together and then fitted them. As for the plates, they are the same ESAPI as the OTV uses. Interesting. Yes I know they are same, however it came with old SAPI plates (black plates), not ESAPI (green plates) so I put it in older OTV. the difference is not a question of color... The main difference is level of protection. ESAPI has a better protection than SAPI. So you've to read label on your plate to know if they are SAPI or ESAPI. And I often see "Hard SAPI" but don't know the difference with ESAPI...? It permit to see the areas of body that are protected by these plates. Edited by P-E, 13 August 2010 - 11:58 PM. Edited by Mercenary25, 14 August 2010 - 04:55 AM. It's hard telling why it had the older plates in it. Maybe the guy thought he was going to have to turn the vest in and swapped them out and then found he wasn't, there is no telling. The ESAPI has been in existance since 06-07 time frame. The primary difference as P-E showed is that the ESAPI have a soft cover over them, this is because the shrapenl in some cases would riccochet off the plate and hit the wearer somewhere else. 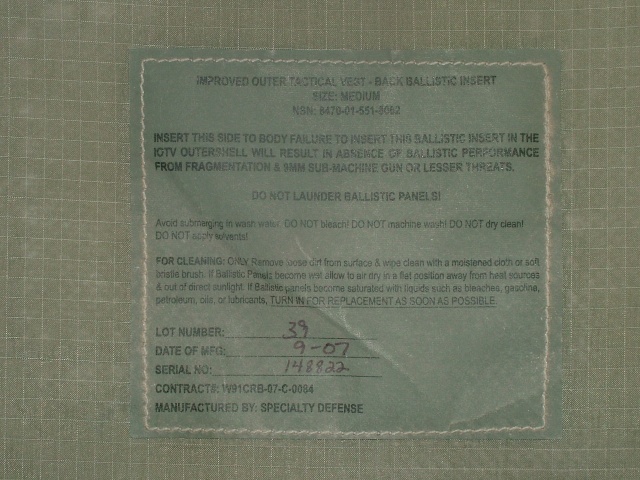 This "soft" cover was added, which is a layer of kevlar that will snag and trap the shrapnel spall better. 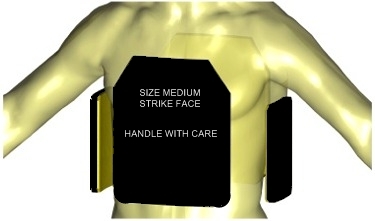 This isn't a issue in the IOTV and OTV as much, but for those wearing plate carriers or aviation armor, it is. My aviation vest, the plate is on the outside of the soft armor and any ricochette's would catch me under the chin. If you are putting the vest on display, now one would be the wiser with the older SAPI plates in it. Now, as for the side plates, I have never seen anything but ESAPI side plates. Doesn't mean they aren't out there, but I have never seen them. Very interesting. I didn't notice the soft cover on ESAPI plates in pictures P-E provided. Sometimes they all look the same. Thanks for useful information! And it's not exclude there's green ESAPI, I just never see them in OD green. Can you ask to your friend if he can take pictures of those OD green ESAPI for us ? (if necessary, he can hide contract number and NSN). I'll be interesting and curious to see them. no problem guy ! :thumbsup: I didn't tell you've wrong, I just want to know if there's a difference. Personaly I don't see difference with colors...that's why I asked (by curiosity). I have to add my two cents about this having just getting back from Iraq about 3 weks ago. As far as i know and it's still this way the IOTV is STILL a Controlled Item ( that has to be returned to CIF for turn in if ETS'ing or Retiring from the service ) and i don't know how you got your hands on one and as for the ESAPI plates those are a Very, Very, CONTROLLED Item for security reasons and not for civilians period unless your DOD and yes they are changing out the SAPI plates right now for all of us that have the IOTV's and some people need not be telling what color is what for reason that need not to be explained ( they were doing that in Kuwait as we were going through there ). And word to the wise- I wouldn't have this out to display right now because someone from the Government / DOD will be coming around asking questions on how you got this because they're cracking down on stuff like this after some people have been trying to sale body armor and plates on Ebay which they won't suppose to and still in the inventory and there's not enough of them right now to begin with and it's a Court Martail offence under the UCMJ or the Federal Government. Edited by Leatherneck-1918, 14 August 2010 - 08:58 AM. The original ESAPI's had a grey colored material that closely resembled the material you find on an ironing board. These were horrible, if they got wet, the material got all lumpy and the plate had to be destroyed. The newer ones have a foilage green covered material on them now that is heat sealed and are much better. at resisting moisture. Leatherneck, agreed, these shouldn't be out by supply standards, but if the military were to take some time at managing their controlled items, then these wouldn't be out of the system. No one from the DOD is going to go to an individuals house and yank a single vest. They are looking for the supply types that get their hands on cases of this stuff and then sell it. If they were worried about controlled items, then about everything you find in a surplus store can be construed as stolen from the military. You can't sling a dead cat on eBay without hitting an ACH. I know a guy by name that was caught selling OTV's to people in the Ukrain, know what his punishment was? Other than honorable discharge and no prison time. The reason, if they do put someone in prison, they have to start answering why they are not managing and tracking this stuff better. Understand your concern, but talking about the material color on a plate is not anything that you can't get from an open source search on google, the pictures of the vest above come right off google. Leatherneck, Iotv pops up on ebay and at gun/military shows from time to time. I found mine in surplus store right next to army recruitment office, the owner told me that he got it from a veteran. Edited by Mercenary25, 14 August 2010 - 11:15 AM. Well this must have come from someone that's either Reserve or National Guard. Us Active duty people are accountable for ours and you better have a good damn reason why you don't have yours. And i'm saying someone can't own one just not right now because there's not enough of these to go around i still had some of my people that went over with IBA's because there wasn't more to issue out. Just don't like it period. Edited by Leatherneck-1918, 14 August 2010 - 12:21 PM. OK, now my $.02. I am National Guard and you hit a nerve. 27 years at this and there is still ignorance like that floating around. I live close to a Active Duty base and watch on a constant basis Active Duty Soldiers that go to the local surplus stores with duffle bags of equipment hocking it for pennies on the dollar because of lack of accountability. When a AD soldier goes home individually because of injury, he takes his stuff with him and in most cases the gaining unit has to start him from scratch because his records don't always follow him. A local pawn shop gets entire sets of IBA and ACH's because of this. Don't throw the Active Duty card out there as the mantle of responsibility, I have a dumpster next to my CHU right now that is full of irresponsibility right now. Uniforms, boots, and field gear that the "AD" threw away. We are all one team and it is offensive for you to come here and bash the Reserves and Guard like you just did, what's your longest deployment so far? Mine is 18 months. Oh, by the way, I have a spanking brand new IOTV as well, know where I got it? A AD soldier sold it to a pawn shop because it fell off his records, so much for AD accountability. Just because they are for sale doesn't mean they should be. And so much for ebay accountability. By their own rules this stuff isn't supposed to be for sale on ebay. As far I'm concerned, those on ebay aren't military issue. because I was told that Military issue ones have "US" on the plates and those plates without "US" are commercial (like those on ebay right now). 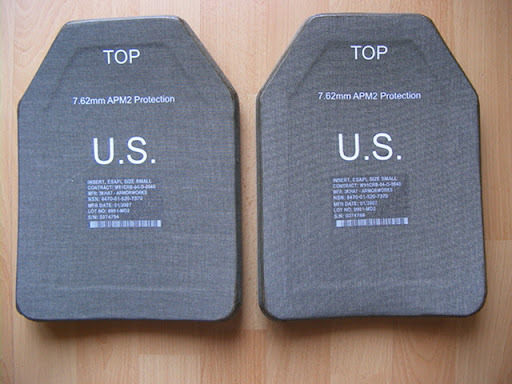 Allowed: Body armor that isn't military-issued or restricted by any laws or regulations governing military ordnance. 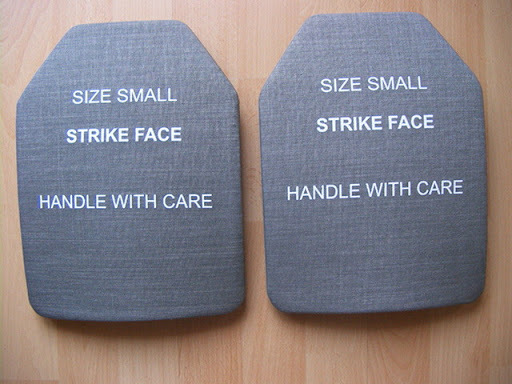 However, to list body armor, your listing must follow certain guidelines. Find out more in the Additional information section below. Edited by Mercenary25, 14 September 2010 - 08:05 AM.